The Blues had plenty of chances to go ahead in the first half, including a wonderfully executed bicycle kick by Erin Cuthbert that was pushed away by City goalkeeper Karen Bardsley. After a goalless first half, City won a penalty just minutes after the restart as Deanna Cooper brought down Nikita Parris in the box. Parris duly fired her spot kick home to give the visitors the lead out of nothing. 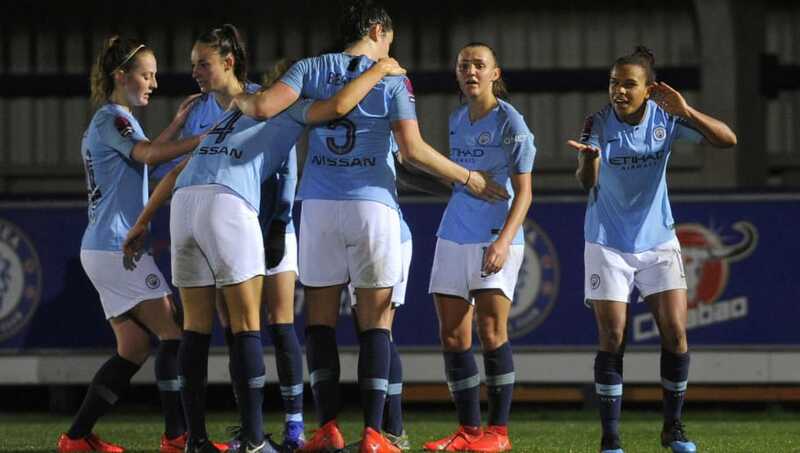 Parris scored her second of the night nine minutes from time, as she got through one on one and slotted past Hedvig Lindahl to send the Citizens through to their third successive League Cup final. Manchester City will now play in the Continental Cup Final on 23 February, at Sheffield United's Bramall Lane. They will face Arsenal or Manchester United, who play in the second semi final on Thursday night. ​Chelsea were all over the visitors in the first half, having chance after chance in the opening 45 minutes. Fran Kirby, Ji So-Yun and Erin Cuthbert all had golden opportunities for the Blues, but were unable to capitalise and take the lead at Kingsmeadow. As City converted a penalty just minutes after the start of the second half, Emma Hayes' side will be wondering what could've been had they taken their early chances. They lost their rhythm in the second half and gave City the passage back into the game, which they duly took. It is a frustrating end to the Blues' Continental Cup run, as they were eliminated at the same stage by the same team as last season's competitions. Starting XI: Lindahl (6); Bright (7), Asante (6), Carter (6); Riley (6), Eriksson (6), Cooper (5), Ji (7), England (6); Cuthbert (6), Kirby (6). Substitutes: Spence (6), Blundell (6), Andersson (6). STAR WOMAN - Although she was unable to capitalise on her chances, Ji So-Yun worked hard throughout the 90 minutes. The South Korean was the Blues' driving force in attack, and although she couldn't get a goal she was Chelsea's standout player. ​Manchester City were admittedly second best in the first half, but they stayed focused and picked up the pace in the second half to earn a deserved place in the Continental Cup final. City were organised and disciplined, and eventually outplayed their hosts. Now it is a matter of avenging last year's outcome in the competition, when they lost 1-0 to Arsenal in the 2018. Now back for the third time in the row, the Citizens will be aiming to win the trophy for the third time, last winning in 2016. Starting XI: Bardsley (7), Stokes (6), Beattie (6), Houghton (7), Bonner (6); Walsh (6), Scott (6); Weir (6), Wullaert (6), Stanway (6); Parris (7*). STAR WOMAN - It was Nikita Parris' brace that sent Manchester City through to the final, as she produced a player of the match performance. She converted her penalty in cool and calm fashion and kept her calm to score late on. The two sides will meet again in the Women's Super League this Sunday, facing off at City's Academy Stadium. They then both have an FA Cup fifth round tie next weekend, with Chelsea hosting London rivals Arsenal and Manchester City travelling to Tottenham.